Man, how cool would it be if you were a totally badass biker and you discovered you could kill yourself, only to return from the grave as an even more badass biker? Psychomania takes a stab at this premise, except the bikers are less like badasses and more like all the nerdy guys you know named Todd if those Todds decided to form a gang. 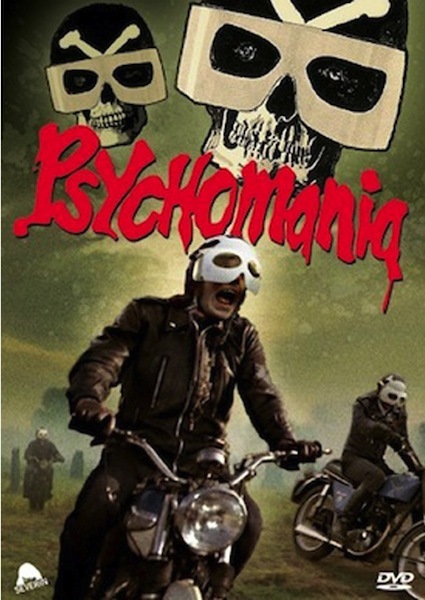 Psychomania‘s biker gang is “The Living Dead,” which was a really fortunate choice for their name, all things considered. They’re led by Tom, who wants to kill himself because he’s pretty sure he’ll come back from the dead, only cooler. I’m not quite clear on why he believes this, other than that his mom’s butler is kind of creepy and goes around handing out frog pendants that apparently possess untold power. That, and his mom’s house is decorated in the latest hip style, but still features a locked room where a fella can don some Buggles-esque specs and peer into a mirror, where the secrets of — well, something — are revealed. Now, as I say, The Living Dead isn’t exactly the toughest bike gang I’ve ever seen. For one thing, they all sport really fruity nametags on their jackets, and the gang’s colors look like they hired a kid from the local “special” school to do the design work and he was short on tools. The bikers all hate the Establishment for keeping them down, but as far as I can tell, the Establishment really just wants them to stop driving their bikes on sidewalks and frightening girls in hot pants or causing bread delivery men to drop their wares. When Tom finally does himself in, the grieving bikers prop him up on his bike (in a hole that none of them seem to notice isn’t quite deep enough to accommodate ol’ Tom), then one of them sings a warbly folk-rock tune about how Tom really flipped the bird at The Man by driving his bike off a bridge. During the touching funeral service, the creepy butler arrives and does his creepy business. The butler (or “Spiritualist” as the credits would have it) is played by George Sanders, who starred in All About Eve and The Lodger before settling into TV and a handful of less-than-spectacular movies. He killed himself after shooting Psychomania but apparently didn’t come back. Eventually, Tom explodes from the grave astride his motorcycle (in a very cool scene), and like you do when you’ve recently returned from the dead as an unkillable super-strong zombie biker, he immediately stops to gas up. After refusing to pay and giving the gas station attendant what for, Tom heads for a pub that looks like it might be in someone’s living room, where he phones his mom. Then he downs a pint and refuses to pay for that. Stick it to the Establishment, Tom! Reteaming with The Living Dead (one of whom looks like the British Michael J. Pollard), Tom convinces the bikers to off themselves, which they proceed to do in ways that tend to require a heck of a lot of effort and/or seem rather unpleasant. Once the gang is dead, however, their reign of terror really gets out of hand as they thumb their noses at truck drivers and ride their bikes around the inside of grocery stores. Only the lone holdout can save the day, although she really doesn’t but I won’t get into spoilers here. 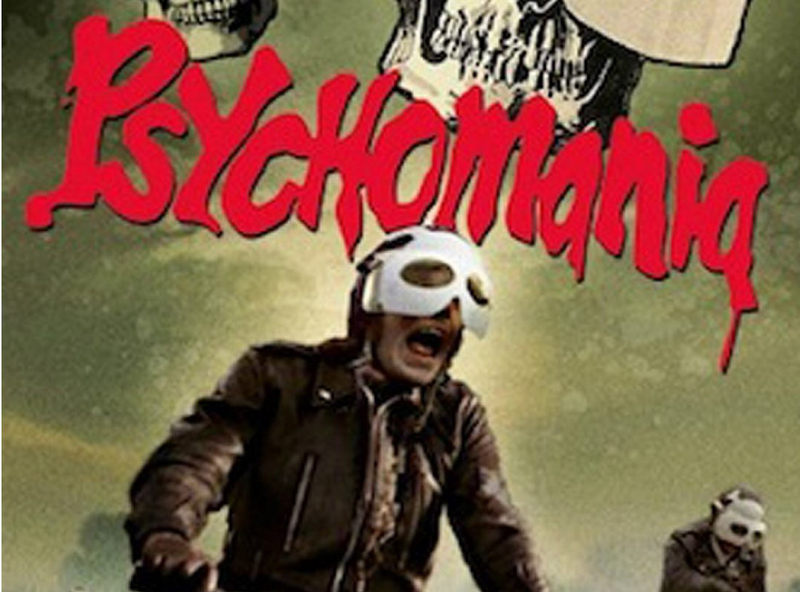 Psychomania isn’t exactly a laff riot, but delivers an ample amount of cheesy goodness for those inclined towards such things and is worth seeing for mom’s decor alone.